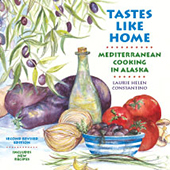 The new June/July 2012 issue of Organic Gardening includes a story I wrote about the James Beard award-winning Gustavus Inn in Southeast Alaska. The Gustavus Inn is owned by Dave and JoAnn Lesh. Their graciousness and excellent food make staying at the Inn a rare treat. 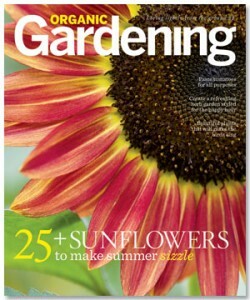 Buy the new issue and read all about it! Next to the Inn, its former owners, Tom and Sally McLaughlin (Dave’s sister) run Homestead Bed & Breakfast. Homestead is a traditional owner-hosted B&B in Tom and Sally’s home and caters to independent travelers wanting a home base from which to base their Gustavus experience. No roads lead to the warmth of Dave, JoAnn, Tom, and Sally’s hospitality. To get to tiny Gustavus, Alaska, visitors must fly or take a ferry from Juneau, Alaska’s capitol city. When I visited the Inn last summer, fellow guests were enthusiastic about spending time in Juneau on their way to and from Gustavus. Juneau has a wide range of activities for all ages, many of them free. There are 250 miles of trails, from easy beach walks to challenging mountain hikes. For indoor enthusiasts, the state museum and Mendenhall Glacier visitor center are well worth visiting. A tram takes visitors to see the top of Juneau’s Mt. Roberts, with its spectacular view of Gastineau Channel. For shoppers, Juneau has stores of every variety and size. 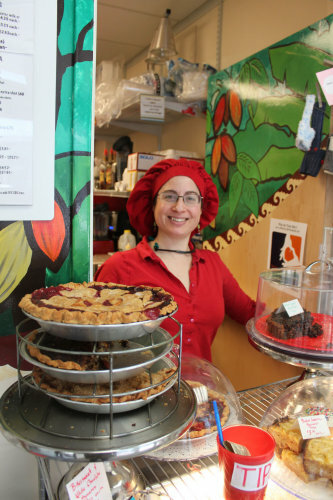 Pie in the Sky, a tiny 200 square foot bakery owned and operated by former professional flutist and former lawyer Andrea Mogil, is one of Juneau’s secret treasures. Andrea offers all-organic coffee and chocolate drinks to accompany her delicious, hand-made, small-batch baked goods. Andrea bakes whatever strikes her fancy each morning; prized items sell out quickly. There was a run on peach pie, Boston cream pie, pineapple upside down cake, and lemon squares the day I visited. I tasted all four and was transported back to my mother’s kitchen, enjoying her excellent baking. Pie in the Sky always has a few gluten-free sweets on hand, including Andrea’s World Famous Brownies (a recipe that won her a trip to a Portuguese chocolate festival); walnut-stuffed figs, an addiction she picked up in Portugal; Almond Macaroons; Spicy Mocha Cup Bottoms (bittersweet chocolate, spices, and 11 espresso beans in one neat little package – Andrea says “Why brew, when you can chew?”); Ginger Meringues, Chocolate Meringues; some flavor of Crème Brûlée; and egg-free chocolate mousse. 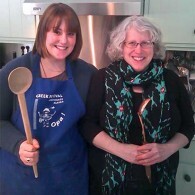 For more information about Pie in the Sky, including pictures of Andrea’s mouth-watering creations, go to the its Facebook page. In March 2011, Juneau’s Capitol City Weekly profiled Andrea and Pie in the Sky; that very interesting article can be found here. 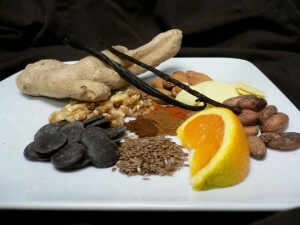 Previous Post: Alaska Forager's Alert!